'Sonja's Selah' (Allan Ensminger, R. 1988). Seedling #81-39. BB, 24" (61 cm), Late midseason bloom. Standards white; falls shrimp red (HCC 616/2); shrimp red (616/1) beard; slight fragrance. Seedling #79-106: ('Almost Gladys' x 'Foolish Pleasure') X 'Almost Gladys'. Varigay Gardens 1989. Honorable Mention 1991; Award of Merit 1993; Knowlton Medal 1997. 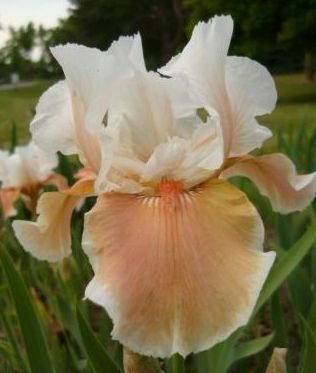 From AIS Bulletin #273 April 1989 Introducing SONJA'S SELAH BB '89 This beautiful near pink amoena has charm and personality. See color ad. $25.00. Varigay Gardens. jpg BHP_0555-X2_sonjas_selah.jpg manage 235 K 20 Feb 2016 - 06:48 BrockHeilman Please contact Brock Heilman for image use. JPG sonjasselah05.JPG manage 77 K 16 Apr 2014 - 00:39 Main.TLaurin Photo by Don McQueen,London, Ont. Canada Zone5. JPG sonjasselah06.JPG manage 78 K 16 Apr 2014 - 03:22 Main.TLaurin Photo by Don McQueen,London, Ont. Canada Zone5. JPG sonjasselah09.JPG manage 60 K 21 Apr 2014 - 12:20 Main.TLaurin Photo by Don McQueen,London, Ont. Canada Zone5. JPG sonjasselah1.JPG manage 547 K 26 Jul 2018 - 21:49 Main.TLaurin Photo by Nancy McDonald-The Pickle Barrel Collection. JPG sonjasselah2.JPG manage 519 K 26 Jul 2018 - 21:51 Main.TLaurin Photo by Nancy McDonald-The Pickle Barrel Collection.